Strider Bikes, the world’s leading manufacturer and marketer of children’s no-pedal balance bikes, is pleased to announce three locations confirmed in its 2016 Strider Cup, a national STRIDER Bike racing series for toddlers and children. These family-friendly races for the tiniest competitors will give small children a chance to put their STRIDER Balance Bike skills to the test at several stops across the country this spring and summer, as well as the final worldwide event in July, the Strider Cup World Championship event. There will be races for 2-, 3-, 4-, and 5-year-olds at each event. Registration fee is $25 online or $35 on-site. Racers will receive a Strider goodie bag valued at more than $50 with their registration. Pre-registration will be available soon; visit http://www.striderbikes.com/events for further information. For the second year in a row, Strider will host races for athletes with special needs at each of the events. These athletes will race the 12” models, as well as Strider’s new, larger 16” and 20” balance bikes, which the company launched in 2014 specifically for the special needs community. 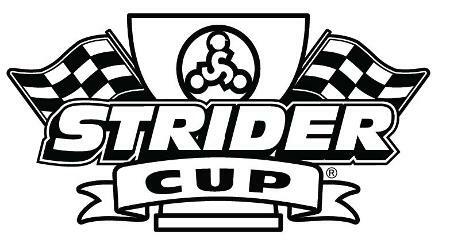 Participating in any of these events automatically qualifies the rider for the Strider Cup World Championship. This series-ending race will be held July 29-30 at Pier 35 in San Francisco, California. Please visit our website at www.striderbikes.com/events for more information. STRIDER No-Pedal Balance Bikes were developed specifically to help toddlers and young children—as well as teenagers and adults with special needs— learn balance and coordination BEFORE pedaling. Strider's trademark simplicity, lightweight design, durability, functionality, and easy adjustability teach riding to young toddlers or those who otherwise are unable to ride a traditional bicycle. With feet safely on the ground, a rider is able to easily maneuver, ride, and race the lightweight bikes. For more information about the product line, visit www.StriderBikes.com. Strider Sports International, Inc., designs efficient, no-pedal balance bikes that encourage people to ride, learn, and explore the world on two wheels. Founded by Ryan McFarland in January 2007, Strider Sports is a company staffed with passionate riders and sports enthusiasts of all types. The goal of Strider Sports is to simplify a bike to its essence, so proper size and lightweight simplicity combine to eliminate any fear of riding and instill confidence in new riders. The STRIDER Bike built for the inventor’s son is now recognized as a global brand, and Strider continues its mission to inspire riding with the creation of Strider riding events and competitions.